Renowned guitarist Tab Benoit embarks on a year-long ‘Whiskey Bayou Revue’ Tour (named after Benoit’s Louisiana-based record label) with a local performance in Nashville at City Winery, 609 Lafayette St., Tuesday, April 2. Showtime: 8:00pm. Tickets: $35.-$48. Info: (615) 324-1010 or visit https://citywinery.com/nashville. Also appearing; guitarist Eric McFadden, whose Pain By Numbers album was released on Whiskey Bayou Records in 2018. 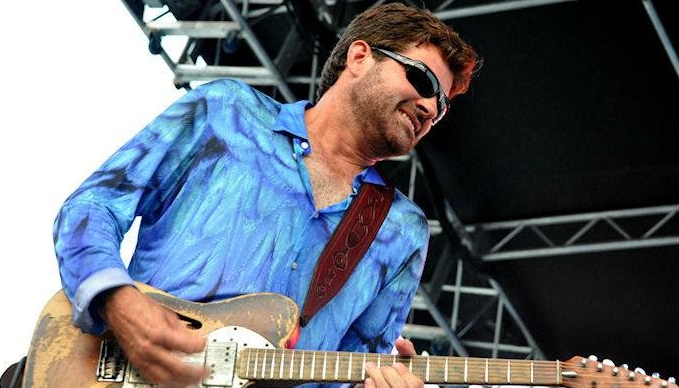 One of the most impressive guitarists to emerge from the rich Bayous of Southern Louisiana in recent years, Tab Benoit’s guitar tone can be recognized before his Otis-Redding-ish voice resonates from the speakers. He doesn’t rely on any effects and his set up is simple. It consists of a guitar, cord, and Category 5 Amplifier. The effects that you hear come from his fingers. Born on November 17, 1967, in Baton Rouge, Louisiana, Benoit grew up in the nearby oil and fishing town of Houma, where he still resides today. Musically, he was exposed early on to traditional Cajun waltzes and the country music broadcast on his hometown’s only radio station. Benoit’s father was himself a musician; as such, the family home was filled with various instruments. He began playing drums but switched to guitar because the only gigs to be had in rural Louisiana were held in churches and at church fairs, and organizers would not allow loud drums to be played at these events. In the late 80’s Tab Benoit began hanging out at the Blues Box, a music club and cultural center in Baton Rouge run by guitarist Tabby Thomas. Playing guitar alongside Thomas, Raful Neal, Henry Gray and other high-profile regulars at the club, Benoit learned the blues first-hand from these living blues legends. He formed a trio in 1987 and began playing clubs in Baton Rouge and New Orleans. In 1992 Benoit released his first recording Nice and Warm on the Justice Label. The title track became a AAA Radio hit and Benoit’s touring career kicked into high gear. Nice and Warm prompted comparisons to blues guitar heavyweights like Albert King, Albert Collins and even Jimi Hendrix. Tab began playing two-hundred and fifty shows a year, a schedule he has kept up for over twenty years. He recorded four albums for Justice Records before being signed to the Vanguard label, and became Louisiana’s Number One Blues export. Vanguard allowed Tab to produce his own recordings; Tab wanted to record the sound that he was trying to create and in 1999 Vanguard Records released These Blues Are All Mine. Tab Benoit’s music evolved again after he signed with the Telarc International/Concord Music Group in 2002. He began to strip it down to a three-piece group, where he found more freedom as a guitarist. He was also on a mission in wanting to use his music and his energy to bring attention to Louisiana’s coastal erosion issues. Tab began to spend more time in the Wetlands and it was where he began to write his songs. Wetlands was the title of his first Telarc/Concord International release. The record combined many musical styles that are indigenous to Louisiana, while he began to play accordion lines and washboard on guitar. Wetlands was a mile marker that definitively marked Tab’s further musical progression into his own original sound and style. Following the release of Wetlands in 2004 Benoit founded the Voice of the Wetlands non-profit organization (www.voiceofthewetlands.org) and began to use music and gather other musicians to use their platforms for getting the message out. He put together an all-star band that featured Cyril Neville, Anders Osborne, George Porter Jr, Big Chief Monk Boudreaux, Johnny Vidacovich, Johnny Sansone, and Waylon Thibodeaux that became The Voice of the Wetlands All-Stars. The Voice of the Wetlands All-Stars have released two CDs and occasionally tour throughout the country. Benoit recently launched his own imprint, Whiskey Bayou Records, with partner and manager, Rueben Williams. The label has thus far released albums by such established artists as Eric McFadden, Damon Fowler, Eric Johanson, Jeff McCarty, and Dash Rip Rock. In 2019 Benoit hits the road for a major U.S. Tour, the Whiskey Bayou Revue, featuring Benoit and several of his label’s artists.